So what are you doing after Halloween? Don’t look at me like that! You mean you’re just going to get dressed up only once, go to a party, and that’s it? Nothing else you’re doing? 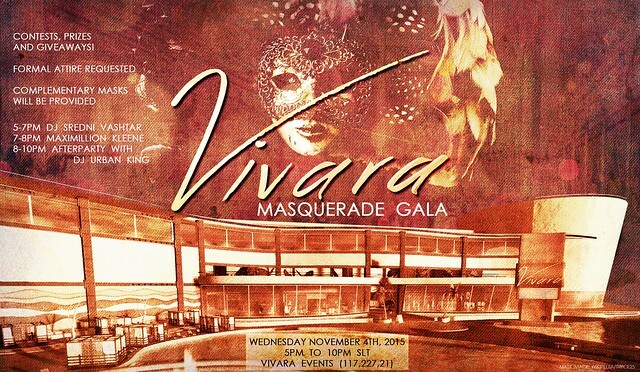 Come to the Masquerade Gala on November 4th at Vivara Events! As I wrote before, Vivara is a giant gaming resort/shopping mall/art gallery that also features parties and a fancy atmosphere worthy of your best cocktail dress and suit. For this event, however, we’ll need you to dress up in your finest gowns and tuxes. And bring a mask! There will be giveaways, prizes, contests, even complementary masks at the door for you to wear. The party starts at 5pm SLT and doesn’t stop til 10pm. Featured stores at Vivara for this event include Pink Fuel, 22769, Jack Spoon, and [ a.e.meth ]. We’ll see you at the gala! It’s going to be a blast! This really looked like it would be a lot of fun, and it’s rare that there’s a social event going on that I’d be willing to actually attend. So I go and buy a new gown and mask for the theme and try teleporting over, only to be cut off on the way because it’s on a skill gaming region and I’m in one of the few states that are barred from entering one of those. So very bummed.